Edgars Fashion Extravaganza 2018 Grand Draw Winners! The Annual Edgars Fashion Extravaganza 2018 Grand Draw was held this past weekend in the capital, Harare. The Grand Draw is an annual event that Edgars holds in an effort to recognise, award and appreciate the support they are getting from their valued customers. 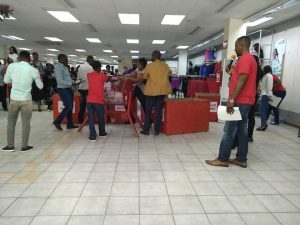 This is an opportunity for the company to say thank you to its customers through running promotions like these which are a platform for Edgars to give back. The grand winner of the 2018 Edgars Grand Draw, was Nelly Marira from Zvishavane who walked away 10000 USD richer. Other lucky winners from the six provincial draws were Dube Nomsa, Benjamin Mahungo, Sipho Moyo, Malvin Tinago, Sipho Moyo, Annastancia Nyakunu and Tanyanyiwa Ray.